Singer and musician Arieb Azhar has very kindly agreed to join Oxford University Pakistan Society (OUPaksoc) on the evening of Thursday 30th June to share his experiences and music with us. The venue for the evening will be confirmed soon. Arieb’s musical journey started as a child as both his parents were involved in television and theatre he was exposed at an early age to different musical expressions. He was greatly influenced by the humanist poetry of Faiz and Sheikh Ayaz, and by the revolutionary music and poetry of Latin America and thus, often performed and sang for left wing student functions and political rallies in Karachi and interior Sindh. From the age of 19 Arieb spent the next 13 years of his life in Croatia and was exposed to Balkan and gypsy music. He was one of the founders of the band “Shamrock Rovers” with whom he recorded two albums of a unique interpretation of Celtic music. Finally in 2004 he returned to Pakistan and always nurturing a love for poets of the Sufi and humanist tradition, Arieb has now found an expression that he can proudly call his own. He recorded an album with IC records in Karachi, by the name of Wajj, which includes the immortal lyrics of Bhulleh Shah, Khwaja Ghulam Farid, and Mian Mohammad Baksh, as well as more contemporary lyrics by Sarmad Sehbai. The last track on the album is a Bosnian folk song also recorded with a rich orchestrated sound that uses both traditional and modern elements. 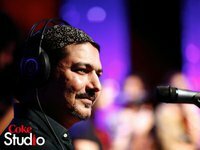 Arieb’s music came into the limelight of the Pakistani music scene because of his input in seasons two and three of the celebrated Coke Studio project. He has toured around Pakistan and also performed at esteemed festivals such as the World Performing Arts Festival of Lahore, the Lok Sanjh Festival of Amritsar-India and the InMusic Festival of Zagreb-Croatia. For any queries/suggestions, please email <president@oupaksoc.org>.